Cockle Cove Press. Publisher of Cape Encounters: Contemporary Cape Cod Ghost Stories, Cape Cod Haunted Map, and Scary Cape Creatures. Dan Gordon first experienced the magic of the Cape as a child vacationing two weeks each summer in Chatham. His admiration for the Cape's soulful homes inspired him to spend the last decade researching the Cape's ghost stories. He has written extensively on international baseball. Combining his two passions, he co-wrote the bestseller Haunted Baseball: Ghosts, Curses, Legends & Eerie Events and the follow-up Field of Screams. Gary Joseph, a lifelong Cape resident, has long been interested in accounts of ghost encounters. As a child, he enjoyed listening to adults tell these stories and observing the way people told them--their expressions, their mannerisms, and how they captivated an audience. His writings have appeared in the Cape Cod Times, Cape Cod Chronicle and SCENE. He also writes about film, natural history, and the outdoors. In this attractive 216 pg. trade paperback, forty Cape Codders describe ghosts who descend staircases that no longer exist, kiss sleeping women, flip theater seats, fold laundry, and join musicians onstage. Among those sharing their stories are the former National Environment Coordinator, a scientist from the United States Geological Survey, a retired West Point professor and a Wampanoag Native-American educator. ​While seeking out only the mysterious, authors Dan Gordon and Gary Joseph instead met thoughtful individuals who related their stories with humor and insight. Those who have experienced America's most beloved summer travel destination will find this collection much like the Cape itself--beguiling, indelible and timeless. 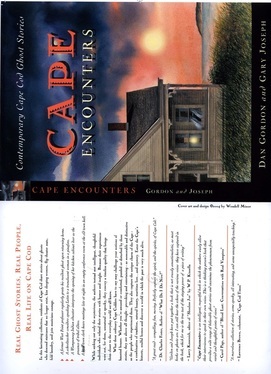 Buy an Autographed Copy of Cape Encounters! Drop us a note if you would like the book personalized. With sufficient notice, we can accommodate. 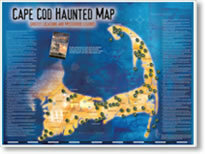 Order Your Cape Cod Haunted Map! Gather around the campfire with this game of strategy using Cape Cod’s spookiest entities as pawns—altogether 52 of the peninsula’s scariest and most famous pirates, ghosts, witches, and indigenous spirits, calling upon their mastery of nature to defeat your opponent(s). Boldness, skill, and timing are needed to enter a mysterious realm populated by a host of weird creature drawn from the Cape’s eerie legends, history, and lore. More than another mysterious, family card game, the lore and history of the Cape are spelled out for children to learn about the different folkloric characters and legends of the sandy peninsula. They’ll become familiar with Old Stormalong, Maushop and other “tall tales” that have been passed down over generations. Just as Paul Bunyan was a symbol of the Northwest (lumberman), waterbeings, mermaids, one-eyed witches, spirit lights, phantom pirates, and bearded sea serpents are among the fabled cast of symbols from Cape Cod’s rich tradition of storytelling. ​This one-of-a-kind card game is the result of a collaboration between the authors of Cape Encounters: Contemporary Cape Cod Ghost Stories and illustrator Ethan Renoe. Order a Set of Cape Scary Creature Cards Now! Click here for more Cape encounters reviews!! Real Ghost Stories. Real People. 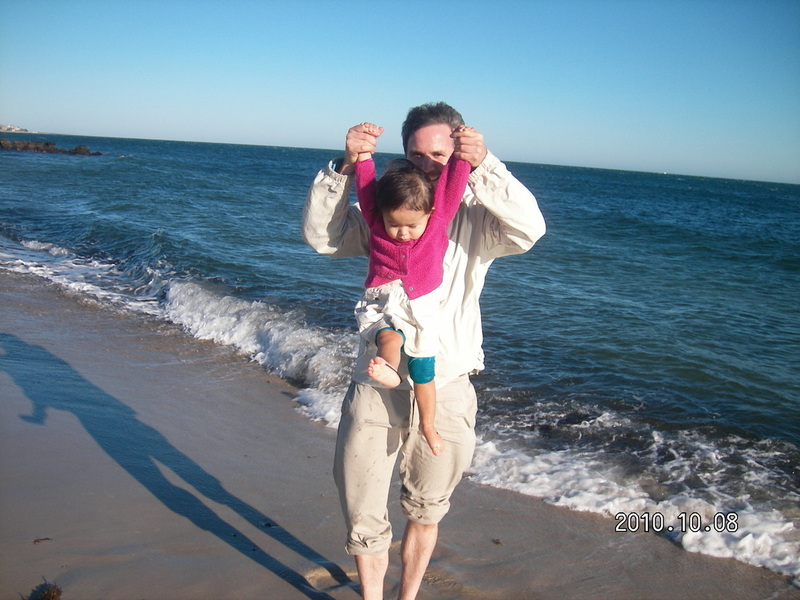 Real Life On Cape Cod. “There's the ghost of the old Namskatet Road. Most of the time he's just present, immanent. I think that most of the time he probably feels reasonably comfortable in this place. And, at this point, there's a continuity. I've been in and out of this house for almost sixty-five years, so I'm not unknowing. It's like people who have had breakfast together for thirty years—they don't necessarily have to have a conversation. While many a rumored Cape Cod ghost can dazzle the eye or raise the hair on the back of the neck, one of the more popular specters at the Inn at Duck Creeke in Wellfleet can hum a few bars and play the flute to boot. Amplifiers mysteriously turn off mid-performance when folksinger Maureen Burke performs onstage at the Duck Creeke Tavern. During duets with her brother, an unidentified third voice has often joined in. Band members from Sylvan Zephyr have seen the ghost walking onto the stage. “I never felt scared there. Some houses you go into, they're cold and they're kind of ominous. You have an uneasy sense when you go into the house. And some houses are very warm, friendly, and protective. Rick Jones has a house that was built in 1678 just down the road in Cummaquid. When you go into that house you feel protected, warm, and confident. “Well, I live in a house that belongs to my family. Some people call it “haunted,” and some of them are afraid to come by because of the stories they've heard—the oral stories they've heard from the tribal members. “I look at it as just the opposite. As a Wampanoag tribal member, I understand that the sounds you hear or the things you may see come from my ancestors, who are protecting us and guiding us. “When you say ‘haunted,' people have a tendency to say it's eerie, it's scary—it gives it a different connotation. “I believe that life and death are one, like the earth and the sky, the river and the seas. That type of association. I don't believe that there's a real end. That's my sense because ever since I was very young, I've held connections with people – a relative or someone in the community—even after their death. I feel that person is my guide, also my protector, my support mechanism. He or she gives me no fear whatsoever. “My grandmother was a historian, and she knew a great deal about Chatham and gave me a great interest in the houses around here. She died when I was eleven, so I don't remember a whole lot of her stories, but she was into just about everything having to do with Cape Cod architecture and history. She would give tours of the town showing all the houses that were reported to be haunted. I always liked haunted houses. When I was about thirteen, my grandmother came back once. I sat up in bed, and I looked over in the corner and I saw not really a person, but the outline of someone. I knew it was my grandmother. I sat there for a couple of minutes and then I said, ‘Oh, cool. She's gone now. That's it.' I think she was just checking on me. It was kind of nice. 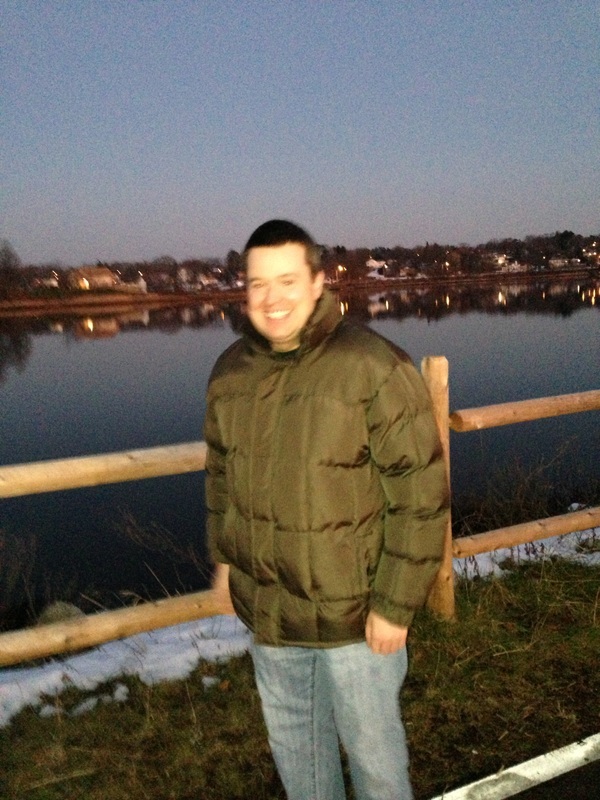 “There's a house right on Oyster River that a lot of my friends had said was “haunted,” if you want to use that word. I was with a couple of friends one night after a party. We were pretty bored, so we decided to go down there and check it out. It's only the second house around here I had ever tried getting into. You get bored around here, you know. “We found a bulkhead door to the basement that was open. We went inside, and upstairs we found this log sitting on the dining room table. So we read it. It basically gave a brief description of the house's history. The person writing it said they liked to call it the ‘cathouse,' because it was owned in the 1850s by this man who lived in the city and would come down on weekends and entertain his mistress. “The house is from 1758. As the story goes, it was inhabited by a sea captain, one of the Rich family. He blinded himself with his own boom in Philadelphia. He had a black servant called Pomp. Pomp was the only black man on this part of Cape Cod, and he was desperately lonely. He went out and hanged himself by Pomp's rock—that's a rock in back. And he became our ghost. Maybe an unresolved life. What constitutes a ghost? I've always wanted to know. What do you have to be to be a ghost? Not all souls become ghosts. Char says many of Provincetown's ghosts are fishing people, giving as an example an incident that took place in a house that she used to stay in on Central Avenue. Apparently, the lady of the house was mixing cake batter when she turned to see a man dressed in a yellow rain slicker, pants that bloused out of his boots, and a blue cap. At first the woman smiled, but suddenly realizing this was a stranger, with annoyance she asked the man what he was doing in her kitchen. At that moment she blinked, and the man vanished. When she described the apparition to her mother-in-law, who lived upstairs, she was told it was the ghost of the mother-in-law's husband, who died at sea. Recognizing his picture in an album she had never seen before, the woman listened as her mother-in-law explained that she'd seen her dead husband many times, watching over her. Bob Harmon says that Osterville also has a lot of supposedly haunted houses. He suspects it's partially because of the high number of older buildings and partially because of the town's seafaring background, which carried with it a lot of Cape folklore. Many of the homes that had a reputation for being haunted were big houses that fell into disrepair when homeowners decided to stay in the Hamptons rather than come back for the summer. One of the more infamous was a house set far back off Main Street with a really long narrow driveway and an enormous beech tree in the front yard and wisteria everywhere. Three houses down by the boatyard also were labeled as “haunted,” as was a building that was torn down next to Swift's Market. But the only ghostly encounter that Bob ever had was in the 707 Building, which was diagonally across from Swift's. Half hidden from Main Street, the no-frills building was once home to a sea captain, but now is a mixed-use building with apartments and commercial space. Bob, now a sculptor, sat down to share his story. He had dark hair with curly front bangs and a full beard and a curious, wide-eyed expression. After joking about tossing his dog (and catching it), photographing it in mid-air and generously offering it to us as a book cover for a work called “The Floating Dog,” Bob described his unusual encounters. © 2004 Cockle Cove Press All rights Reserved.